It was a magical moment that left one lucky driver in complete awe. 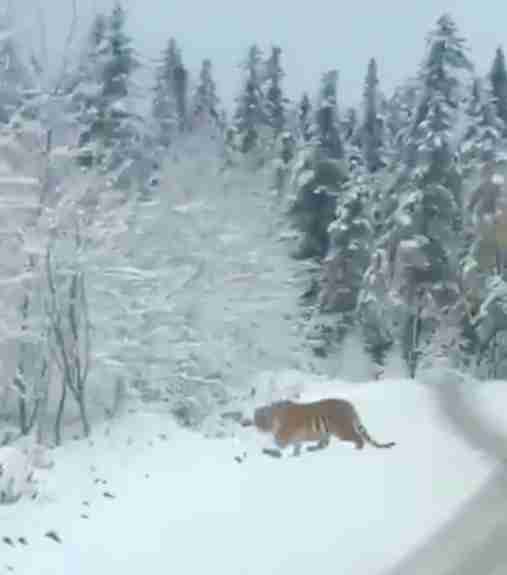 Travelling through the snow-covered roads of Heilongjiang, China, earlier this week, Terry Townshend noticed that a rather large animal was crossing the road up ahead. He slowed down to allow the animal to safely cross — and that’s when he noticed who the special animal really was. A wild Siberian tiger was in his path, slowly sauntering into the woods at the road’s edge. Her striped tail swirled up into the cold air as she passed right in front of his truck, and then disappeared into the heavy brush. 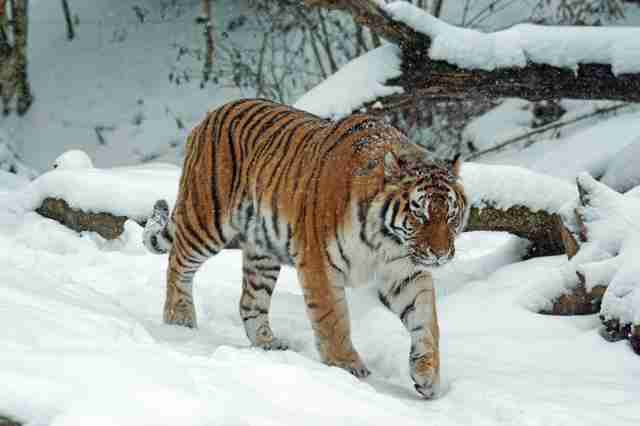 Against the white snow, her bright orange and black fur seemed to pop as she casually trekked farther into the woods. As Townshend passed, she looked up at his truck with curiosity. The peaceful moment was all caught on camera, since once Townshend noticed who was ahead, he made sure to record the scene. Since sharing his amazing encounter on Twitter, Townshend’s video has been viewed thousands of times — and people are just as surprised as he was that he was able to cross paths with such a beautiful animal. Since Siberian tigers are a critically endangered subspecies, with only around 500 individuals left, seeing one in the wild is one of the rarest sights in the world. A mix of poaching and habitat loss has knocked off much of the wild population, but the few remaining tigers mostly frequent the snowy, isolated Himalaya region between China and Russia. Fewer than 3,900 tigers total between the subspecies are thought to live in the wild today, compared to around 100,000 who lived across Asia a century ago. This encounter was surely a once-in-a-lifetime moment by today’s standards — but with our help, these big cats can start living safer, more peaceful lives in the wild where they belong. To help protect tigers in the wild, you can make a donation to Panthera’s Save the Tigers fund.